As you may have seen, four Marine Corps generals and Sergeant Major of the Marine Corps Mike Barrett sat down with me recently and discussed a variety of issues, including the commandant’s new tough plans for barracks security, the manpower drawdown and the future of the service after Afghanistan. Marine Corps Times: One of the reasons there is push-back is because you’re dealing with so many things. There are money concerns, the drawdown, all these variables that are unclear. Nicholson, a salty commander who is popular with many of his troops, went on to make the case that because some of the initiatives the Corps is gravitating to now were in place years ago, there is really no change at all. the one thing i liked about the rolled sleeves was the fact it separated us from the other branches. another attention to detail part of putting on our uniform everyday. now we are just being lazy and waisting time on stupid topics such as rolling sleeves or not rolling sleeves when we could be focusing our time and energy and hassle on doing something actually productive. Just give them their rolled sleeves back, why piss them off? The commandant making this monkey rule in the first place to me, shows a lack of focus on important issues. Makes no sense. Sounds to me someone with small arms is afraid to let people know they have been missing workouts. Change for the sake of change isn’t worth a damn. The rolled sleeves were a smarter crisper look. Glad I’m out! I’m glad you’re out too! I’ve only been in 8 years so all of this is change to me too, but you won’t hear me whine about it. Everyone GTFO, it gives better chances for us to advance and be retained. Jay, if you need more people out in order for you to have a chance to get promoted maybe you should get out yourself. It’s like 90 % on you to get promoted. The other 10 is people taking up space. Anyone ever pay attention to how the generals talk? They do two things: 1) they actually say nothing of substance 2) They always turn things around and spin it so that the problem appears to be the doing of others and at the same time they act as if nothing has happened. Maybe MCT should have pressed the general to explain how going from sleeves up to sleeves down, in any way, on any planet, according to any set of logic, equates to “There really isn’t change at all.” If you go from A to B and A does not equal B then there’s a change. I wonder how the generals feel when they violate rules of honesty with statements like that. Sleeves down make sense. Sleeves down is how we train and deploy, it stands to reason that sleeves down should apply in garrison. Sean, I also pissed in bottles while on post when deployed. Should we do that while standing duty in garrison now? I was happy about the sleeve change. I’m a pretty small person and it was difficult to get the sleeves properly rolled because I had to add extra folds so they would fit me right. I’m glad I no longer have to waste so much time attempting to make them look nice. In therater, sleeves down. Hot weather garrison, sleeves up. It functions for the majority and is practical, we are no here to cater to the whinning few. I am pretty sure they had a logical reason for going to sleeves down. However, rolled sleeves separated those Marines that cared from the ones who didn’t. Some complain about being to small or wasting time which is selfish. Rolled sleeves brought competitiveness amongst Marines. They allowed us to stand out. Sean said sleeves down because that is how we train. If that makes sense why are they making Marines on duty wear Charlie’s. We do not wear Charlie’s on post in theater. Typical garrison Marine Corps issue. The CMC should have some concern for the views of those he sends into combat. Although sleeves seem to be a small issue it nevertheless affects troop morale. It would be interesting to know the genises that resulted in the sleeves down issue. Sleeves? We are down to talking about jack, so another war ends and the lifers resurface, God Save the Corps! I spent many great years in the Corps. I went through many uniform changes some good, some bad. Most of you reading this, didn’t have to wear wool or poly-wool blend service dress uniforms. Name and service tapes on the cammies (anyone remember when we called them that? … LOL). An now for the sleeves issue. Sleeves up did serve to seperate the Marine from everyone else. Course, this was back when there was same camo patterns for the us military. When there was major unrest in Haiti (1994), the Marines were referred to as white sleeves(I’ll leave it to you, to guess why). Word went out amongst the haitians, that the white sleeves(Marines), were not to the ones to be messed with. IF a little extra attention to detail is too much, to have the rolled sleeves look correct. Maybe your a wee bit lazy, too spend a few more minutes on them . Pressing my utilities and spit shining my boots(An yes, I said spit shine. Which is now a lost art), was not a bother. It was a way, for me to express myself. IT “DAMN SURE” felt good. Stepping out in my pressed uniform, with creases that could cut, boots that looked like glass. Looking good(and feeling good) and proud that I am US Marine. As we approach The 238th Marine Corps Birthday Ball. I hope that all of you, ;ook your best and enjoy the evening with your fellow Marines. I agree with Kazsearn because I remember when you did spit shine your boots and shoes because it did set you apart from from everyone else. You took pride in the way you looked, dressed, and carried yourself. It said that you take that extra time to make yourself look even more presentable. I was in before the whole name tags on cammies. I wanted to be different and put that extra something in, thats why becoming a Marine wasn’t a change for me I already lived that lifestyle because I already shined my shoes for school and work regardless of what I was doing. People are focusing on the wrong things, stuff changes… As Marines we adapt and overcome…. Or do they not teach that anymore? 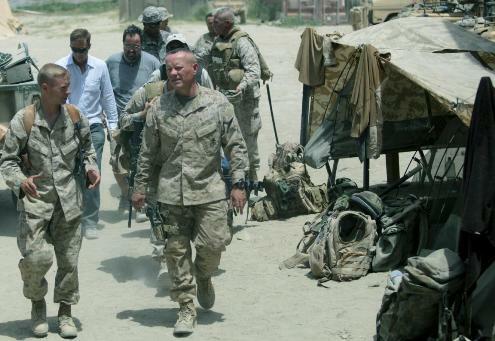 Having well-rolled sleeves is not a sign of a outstanding or hard-charging Marine. All it means is that the Marine is good at rolling cammie sleeves, which is really not a big deal in the grand scheme of things. To A female Marine, you are 100% correct. Rolled sleeves aren’t a sign of a hard charging Marine. A hard Charging Marine has a neat and clean appearance. As well as leads from the front, in performing their duities in a professional manner. Everyday I throw on my t-shirt and jeans and,grab my books, and head off to class. Ahhhhhhh…….get out and use that GI Bill fellow ruffians. Then you get to be the boss everyday! Ow! Stay lethal marines! Gents…now you dont have to worry about displaying your tattoo “sleeve”. Except for when its 100 degrees out! Well, all good points. I can see the sides of all arguments here, from sleeves don’t make you a hard charger, to sleeves helped separate us from the other services. Well to those who make the argument that sleeves don’t make you any better of a Marine, I would agree, however, the way I see it is having good tight sleeves took practice and patience, it was an art. In that respect the better your sleeves the more attention you gave to them, the more pride you took in your personal appearance, which is, by the way, part of being a Marine. Being good at your job is one thing, but how do I know you are good at your job when you cant do something as simple as get a hair cut and roll your sleeves well? how do I know you will put the attention to detail into your job that the Corps needs if you cant do it to your sleeves. We don’t need the Marine Corps to cater to lazy people, if you want to be lazy join the Army. Dang. I just realized…I’m Old Corps and have no idea when it happened. I should go buy a grave and leave these horrible uniform change proposals to those who have to wear them. All I ask is that when it comes to Dress Blues, let women look like women and let men look like men. The latest stupid proposal is an attempt to preempt the discomfort of seeing two men dance with each other at a Marine Corps Ball. Nobody wants to see that, and making women look like men is an effort to camouflage this unnatural spectacle by making everyone look like they are dancing with men – lumpy men. That awful shower scene in Stormship Troopers is just on the horizon as the desirable differences between men and women and the joy they bring are cast aside. Maybe Amos should just retire before he gets embarrassed into it.